Cold Steel's Skull Head City Stick is both dangerous and elegant. Designed for urban self defense rather than to be a walking aid, the stainless steel and fiberglass walking stick will serve for either purpose. Cold Steel makes several different models of City Sticks and the Skull Head is one of their heaviest, weighing 27.7 ounces. That's more weight than mall walkers usually choose to carry, but this is more than the average walking stick. 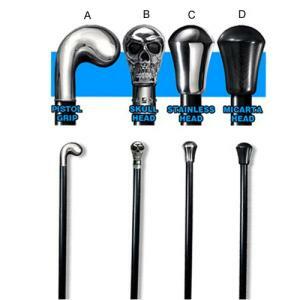 The Skull Head City Stick is a modern version of the old Irish shillelagh, an end-weighted fighting cane. The traditional version's knobbed end is carved from the root knot of blackthorn, now hard to find in the Isles because of the continued demand for this old weapon. Cold Steel brings it to a new level with a stainless steel handle and a thin fiberglass shaft -- eleven layers thick -- that's virtually unbreakable. Smashing concrete blocks or shattering bricks is easy. Two large men standing on the shaft won't break it, and it's not likely that you will. Wooden canes of similar size are common martial arts weapons in many cultures -- none of them match the City Stick in strength and durability. The skull-shaped handle of cast stainless steel could be marred by smashing bricks or pavement, but it's securely bonded to the cane itself and not likely to be seriously damaged. Whatever you hit with it will be. If you like the look of this self defense cane, be aware of its potential for mayhem. If you only need something to keep the neighbor's dogs at bay, you can get by with less. The 37.5-inch cane generates a lot of impact force when smartly swung. Striking with the cane tip rather than the skull handle is a more reasonable solution to everyday problems.